Crispy Ewenity Curds. A shareable tasty snack. With house-made ketchup. Having enjoyed Globe many times over the years, I was happy to visit their newly-opened restaurant Earth up at Yonge and Rosedale. Meant to be a dressed-down version of Globe, its sleek and organic mix of black and beige doesn’t quite give off a truly casual vibe. Decor aside, what truly excited was what the menu offered. Luckily, we were a four-top (having hoofed it up after the Thomas Keller talk at the Toronto Reference Library), and a four-top meant lots of dishes! After perusing the menu, we put in our order and waited for the train of dishes (we uh… ordered a lot), tempering our anticipation with the knowledge that Earth had only just opened the previous weekend. To start, we were offered some rather decent herbed scones – a little different from the norm. It was a nice touch. After a slight pause, the appetizers came out. 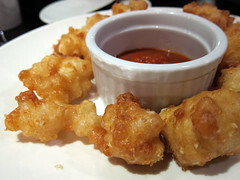 Crispy Ewenity curds, battered, fried, and sided with some house-made ketchup arrived at the table. Interesting in taste and texture, the crispy exterior and smushy interior made for a fun snack. Our wood-oven baked flatbread (a.k.a. pizza), was okay – I feel that they could improve on the crust by a lot. We had the Fishetarian and I didn’t get very much of a smoked fish flavour off of it. I can see this being a good shared app between two. 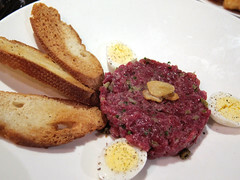 Elk tartare was ordered twice at the table and both recipients liked it in varying degrees. A solid offering with an Elk-twist. So, with that many apps there was still one more: the pig bits. Fried pig’s ear, creton, and a generous portion of head cheese. We were pleasantly surprised at the bounty when it hit the table. Served with some crisps (more please!). Going around the plate: the pig’s ear was only okay (we had really good examples in Quebec earlier in the year), the creton was quite good, and the head cheese was really good. Chunky and a good chew to it. This would be a re-order dish. Kozlik’s double crunch mustard rounded off the plate. On to the entrées. I went with the daily dish, a creation of scallops, golden beet purée, and maple pesto. A light dish, much appreciated after the gorging on apps. Found the intriguing pesto-maple combination not as tasty as it was interesting. An elk shepherd’s pie and the lobster stew made it to the table as well. From only small tastings, the former was decent, the latter could use some work. And then there was my favourite dish of the night, the slow-roasted Tamworth suckling pig. Sided with braised local beans and really delicious boudin noir. The crackling was crisp and yummy. This dish was extremely hearty and just right for the cold weather. If you order this, I hope it will be as good for you as it was for me. I think this was my favourite boudin noir of the year. And that’s including my Montreal trip! It was the end of the night and we were stuffed. So what did we do? We ordered dessert! Propelling us into food coma was the tarte d’erable with bacon cream our waiter spoke of. Having made and eaten several maple pies this year already, we were interested to see what Earth could offer. I felt the crust could use more baking – I like ’em toasty and so, this was too raw and mushy for my taste. The filling – I wished there had been a bit more and a stronger maple presence. Perhaps a spoonful of maple syrup on top (like at Au Pied Du Cochon) would give it a sufficient maple-kick. And the cream – dense and bacony – good, but overwhelming. I’d like something lighter and more subtle to complement the tart. Despite its so-called “cursed” location (umpteen restaurants have been in the spot), with some tweaking of dishes, Earth has much potential to call the place home. I’m looking forward to a subsequent visit.